If you are tired of sloppy and unresponsive shifting, upgrade it to the Rogue Engineering Octane Short Shift Kit! Rogue Engineering has come through again with their new Octane Short Shift Kits. Rogue Engineering's long hours and advanced engineers paid off, creating one of the smoothest and most advanced short shift kits available. Using simple designs and new technology to create a short shifter that will out perform your stock shifter in every aspect, truly putting the BMW engineers to shame. So if you are tired of sloppy and unresponsive shifting, upgrade it to the Rogue Engineering Octane Short Shift Kit! The Rogue Engineering OCTANE short shifter represents years of experience and research in BMW short shifting products. With feedback from thousands of users and the measuring of countless prototypes, OCTANE is the culmination of a tremendous amount of research and development. This R&D is a continual process and does not stop. Rogue Engineering idea of a short shift kit is not substituting levers in place of factory ones just because "they fit". Throughout the 80s until recently, BMW was notorious for using only a few specific shifter levers for their manual transmission vehicles. For other companies, making just a few "replacement levers" and offering them in place of those factory part numbers was an easy way of calling it a short shift kit. Unfortunately, for those companies, BMW started using many different part numbers making it more difficult to just "swap in a lever". Rogue Engineering only develops it's short shift kit with test vehicles in their facility, testing numerous prototypes, offering others to test it before settling on it's final design. We feel that this old school, real world testing is the best way when modifying OEM ergonomic, sensory-based controls. Wow! This is all I can say, I ordered a Rogue Engineering Short Shift Kit for my E90 335i and it is a 100 times better then oem. Shifting is smooth as butter and never any notchiness. A definite two thumbs up! I would recommend it to everyone. To appreciate the specific advantages of the OCTANE short shifter lever, one must understand the details that make it unique to all others, the heart of the OCTANE short shift kit. The Rogue Engineering OCTANE WSR is easy to install, even for the novice mechanic. Since the OCTANE WSR is included with most OCTANE SSK, you simply install it when you install the OCTANE SSK! There is no "universal" WSR since each is engineered for specific applications. The Rogue Engineering OCTANE short shift kit comes complete with all necessary parts for a professional or do-it-yourself install. Installation times will vary with experience and available resources (access to the underside of the vehicle is required. Please note that our OCTANE short shift kits are complete kits. All OCTANE short shift kits include OCTANE specific WSRs (which are different from our factory replacement versions) unless otherwise noted. There are no additional bushings or bearings to buy to inflate an artificially low price point. The prices below reflect a kit with all required parts from our research at Rogue Engineering. Until now, only the factory shifter lever was designed to be a vibration-absorbing, acoustically damped unit. BMW engineers employ vibration-dampening materials in their carsâ€™ motor mounts, transmission mounts, subframe mounts and in various other areas for good reason â€“ to isolate the cabin from excess vibration and noise. The OCTANE short shifter lever uses superior materials, bonded and secured to achieve a shorter, more positive shift throw without sacrificing the vibration dampening that BMW engineers built in. Some companies may allude that their "manufactured" lever is in some way superior to a factory lever. Simply machining a three decade old shifter design is not our idea of forward thinking. We do not take steps backward in shifter technology, only forwards! By using a custom-extruded neoprene rubber insert, the OCTANE shifter is able to both minimize the NVH (Noise, Vibration and Harshness) more than any other shifter on the market. By being able to design specific characteristics into the insert, we are able to minimize unwanted shifter free play while minimizing excessive harshness. Without sufficient material to address NVH issues in the driveline, you wind up with a shifter that vibrates and buzzes. As a matter of fact, the OCTANE shifter lever has now 308% more vibration-absorbing material than the closest competitor. Shifter "isolation" should not be mistaken for "vibration-absorbing". Just because a shifter lever is built to be "isolated", do not mean that it has adequate materials to both acoustically dampen or absorb vibrations. If you want to maintain the vibration absorbing characteristics of a factory shifter, then your shifter lever better be made in a similar manner, using comparable materials! The lower portion of the OCTANE short shifter is made from CNC'd 303 stainless steel. This material was selected because of its superior corrosion resistance and strength. Although it no difference in manufacturing costs to machine an integrated pivot ball, we decided against this as you will shortly discover why. After extensive research and testing, we have discovered and implemented what we feel is the ideal pivot material. The thermoplastic material used in the OCTANE short shifter maintains the vibration-dampening qualities and built-in lubricity of the stock shifters thermoplastic pivot, but adds superior resistance to heat and wear. Unlike rigid metal balls or bushings, Ertalyte TX is proving to be the best material for the application. With a coefficient of friction that is 421% better than a stainless steel pivot ball, it combines all the benefits of smooth movement with durability beyond all other thermoplastics. Even with all of the fantastic properties of Ertalyte TX, we have designed the lower pivot point to be replaceable, should it ever need to be replaced in the future for any reason. The latest innovation implemented to the OCTANE short shifter is our exclusive Self-Adjusting Pivot Point (SAPP). 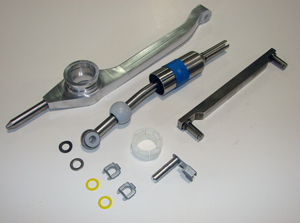 Most other shifters (including the factory), rely on a pivot assembly that binds when new, requiring a "break-in" period to allow for new washers and clips to wear in. By the time these parts have "broken-in", unwanted play is now introduced, resulting in a potentially sloppy shifter feel. Rogue Engineering's SAPP eliminates this break-in period, allowing the pivot to move freely at all times. The simple spring mechanism used in the SAPP removes any play in the pivot assembly, which continually loads the pivot assembly with a 6 lb. load (force), continuously compensates for bushing wear. The effectiveness of the SAPP is also enhanced by its simplicity, as there are no intricate mechanisms to ever fail. Rogue Engineering is proud to introduce the most technologically advanced short shift kits available for BMWs. At Rogue, we realize that simply shortening the shift lever or moving the pivot point will not produce optimal shift feel. The smooth action that sets the OCTANE short shift kit apart from the others comes from our unique Weighted Selector Rod. With the introduction of the RE Weighted Selector Rod, you can enjoy the benefits of a short shifter while improving shifter smoothness and virtually eliminating the gearbox notchiness and gear whine that is associated with some manufacturer kits. To fully understand and appreciate the beauty and benefit of the RE Weighted Selector Rod, we must first revisit the mechanics of a short shift kit. When a short shift kit is installed, the throw reduction is directly proportional to an increase in shift effort. In simple terms, if a short shift kit reduces throws by 30%, then the effort required to shift into gear increases by the same amount (30%). While some people find this increase acceptable, others do not like the increased gearbox "notchiness" that is associated with the increased effort. The latter group describes the increased notchiness as a decrease in gearbox smoothness, and a departure from the feeling of refinement that led them to choose BMW in the first place. The Rogue Engineering WSR replaces the factory selector rod with a higher quality, CNC'd 303 stainless version that has significantly greater mass. This mass, added on the low side of the shifter assembly, is completely hidden from the users view, but its benefits are obvious. Honda (known for its silky-smooth short-throw shifters) uses heavy cables to actuate the shifting. Now the secret is out for BMWs. As documented in the case of the 1995-99 E36 M3, adding 426g (nearly 1 pound) to the selector rod reduces most gearbox notchiness and improves smoothness. 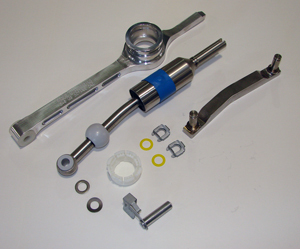 A common "Band-Aid" to address the increased notchiness and required effort of short shift kits has been the addition of a heavy aftermarket shift knob. Whereas a factory BMW shift knob typically weighs 3.0 ounces, some aftermarket shift knobs can weigh nearly TEN times this amount. While this additional mass can counteract the notchiness of the short shift kit, it can also make the user feel much like they're manipulating a grapefruit. Additionally, most metallic shift knobs (aluminum, steel, titanium, etc.) can get blazing hot in the summer and ice cold in the winter. Most generally overlook this detail until they actually touch the knob, either searing their hand or getting frostbite. Another disadvantage to the heavyweight aftermarket shift knobs is that they do not match factory interiors like factory BMW knobs. Most of our E46 M3 and E39 M5 customers love their factory BMW illuminated shift knobs. Even with the addition of our short shift kit, they prefer to continue to use the illuminated shift knob. Now they continue to retain their factory shift knob while benefiting from smooth, notch-free shifting with the Rogue Engineering Weighted Selector Rod. At Rogue Engineering, we also know that it is possible to have too much of a good thing. While prototyping the RE WSR, we found that adding too much mass made the shifter feel too smooth. So we experimented and tested various different weights and found a perfect balance between "too much" and "not enough" mass. The end result was our current WSR. This perfect balance allows decreases notchiness while retaining a comfortable and acceptable amount of gearbox effort. Ertalyte TX is an internally lubricated thermoplastic polyester that provides enhanced wear and inertness over general-purpose nylon and acetyl products. Ertalyte TX contains a uniformly dispersed solid lubricant, providing a lower wear rate and coefficient of friction than unmodified polyesters like PET or PBT and even internally lubricated materials like Delrin AF. As the table above shows, most thermoplastics have very low coefficient of friction, making them a good choice as a pivot material. In the past, even BMW used steel shifter pivot balls, but moved on to thermoplastic in the late 90s. All new BMWs now have thermoplastic shifter pivot balls, from their least expensive BMW all the way to the $130,000 Z8. At Rogue Engineering, we know that stainless steel is not an idea pivot material, because of its relatively high coefficient of friction and its inability to dampen vibration. Ertalyte TX is 421% more lubricous than stainless steel and dampens vibration. Though thermoplastics have their benefits, using just any thermoplastic would not be ideal. Durability is also an issue that must be considered. As shown in the table above, some materials wear more quickly than others do. If lesser materials are used, premature wear can result. Whereas UHMW had the lowest coefficient of friction, it also has inferior wear characteristics. What good is a pivot that wears out too quickly? Ertlayte TX is 315% more durable than UHMW. The ambient temperature of a BMW drive train can reach 200°F. At these temperatures, some thermoplastics can start losing their advertised chemical and physical properties. Extended exposure to higher service temperatures cause some thermoplastic parts to become brittle, and eventually fail. We have seen the non-replaceable thermoplastic pivots of BMW factory shift levers become brittle after just a few years of use. None of the above listed thermoplastics meet the requirement of 200°F, except for Ertalyte TX. Even though Ertalyte TX is designed to handle such temperature and wear, the pivot of the OCTANE short shifter lever is replaceable, if ever required. But what about those steel balls? Many hours of research and development go into our products to make sure that all bases are covered. BMW's change to a thermoplastic pivot was hardly a cost savings measure, as using multiple materials in the manufacture of a single part dictates a more complicated manufacturing process. Although it would have been much simpler to machine a pivot ball into our stainless steel lower shaft of the lower section of our shifter lever, we knew that this would not be the best solution. It safe to say that those manufacturers using steel pivot balls are actually the ones taking short cuts. Perfection? We've got the CNC program to prove it. Like many of the parts in the Rogue Engineering OCTANE short shift kit, CNC machining is the only method to accurately duplicate the parts required. This ensures that the end user gets the same product that we continue to improve and develop on a regular basis. An important data point during development was the actual tolerance of the pivot ball. During our development, we actually tested more than ten different samples of pivot dimensions, in the effort to find the optimal solution. What we discovered was that "factory-like" tolerances were in fact, a bit stiff. Naturally, by machining new samples in specific increments, we were able to determine dimensions that were unacceptably loose and those that were too tight within the pivot. After selecting the best fitting sample, we were able to test our findings. What we found was that our pivot was in fact, 41% smoother than stock. An alarming discovery was that our pivot was 300% smoother than another popular aftermarket shifter. Although a detail such as the actual pivot resistance may seem trivial in the scheme of things, we're used to sweating the details. At Rogue Engineering, we wouldn't have it any other way.